Are you house clearing or refurbishing? Hire a skip for all your waste and have it all taken away in one go. 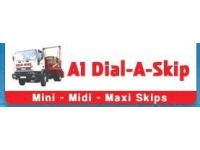 We have mini, midi and maxi skips depending on your requirements. Our skips are perfect for waste builder's materials, home and business clear outs and gardening rubbish. The skips are available for short and long term rentals depending on your project size. We also have a grab wagon with operator available to help you with that larger, heavier rubbish. For a service you can trust call A1 Dial A Skip we'll have your skip delivered on time and we are registered waste carriers with the Environmental Agency so you know your skip fill will be disposed of in line with regulations.